The 35th annual QuickChek New Jersey Festival of Ballooning in Association with PNC Bank plans to celebrate its anniversary with its largest lineup of special shaped hot air balloons and its biggest concert series ever. 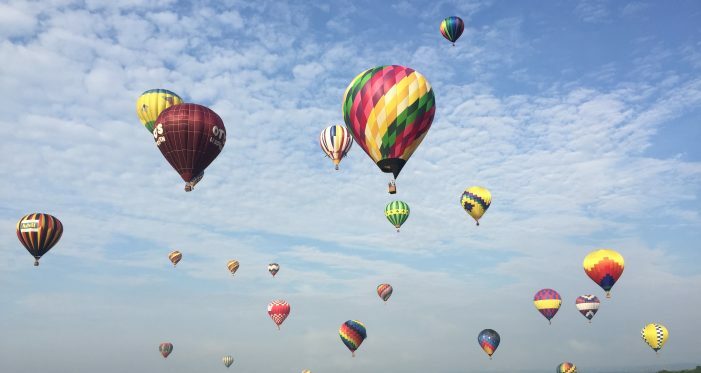 The three-day Festival, July 28-30, at Solberg Airport in Readington, features the awe-inspiring spectacle of 100 sport and special shaped hot air balloons from around the world taking to the skies twice each day in mass ascensions over the scenic countryside. Four-time Grammy Award winner Pat Benatar heads the list of performers who will take the new Progressive Main Stage at the largest summertime hot air balloon and music festival in North America. Perhaps no special shape balloon better represents the Festival than the QuickChek Farmhouse. Complete with a 61-foot-tall silo, 30-foot-tall farmer and friendly animals including a cow, a pig, a cat and chickens, this giant red barn fits in perfectly with the tranquil and rural Hunterdon County setting and QuickChek’s mission of being fresh and local. There’s a lot of buzz with the “Little Bees” – a pair of 110-foot-tall bumblebees who hold hands and “kiss” in mid-flight! They’ll be joined by their 80-foot-tall baby bee. The festival will once again honor America with the five-story tall PNC American Flag balloon; created following 9/11, it is the world’s largest free-flying American flag and has become an annual crowd favorite. Other special shaped balloons include an 85-foot-tall lion, the 110-foot-tall Unique Photo panda, the 105-foot-tall Bimbo Bakeries bear, an 85-foot-tall Angry Bird, an 80-foot-tall Pepsi football, and a 67-foot-tall superhero from Canada. And what’s an anniversary without a cake? The cake special shaped hot air balloon is 80 feet tall and weighs 807 pounds! Expect the biggest names in music, too, with five headlining concerts. Best-selling children’s recording artist Laurie Berkner performs Friday, July 28 at 1:30 p.m. with George Thorogood and the Destroyers playing Friday night at 8 p.m. followed by a fireworks display. Internet sensation Jake Miller performs Saturday, July 29 at 1 p.m. with Pat Benatar & Neil Giraldo performing Saturday night at 8 p.m. in conjunction with the nighttime hot air balloon glow. The Plain White T’s perform Sunday, July 30 at 3 p.m. The festival offers 39 hours of affordable family entertainment including fireworks; a nighttime balloon glow; the acrobatic AeroSphere Balloon Show from “America’s Got Talent;” children’s amusement rides and entertainment; exciting interactive exhibits and hundreds of crafters and food vendors. More than 1,000 people will take a ride in a balloon at the festival. Tickets are available at all QuickChek stores; call 1-800-HOT-AIR9 or online at www.balloonfestival.com. Tickets are $20-$35 for adults; children $8-$15; ages 3 and under free; VIP: $60-$125; Military discount available.